The Catholic Literature Committee is mandated to promote good Catholic literature to the parishioners by providing Catholic magazines, pamphlets, newspapers and seasonal reflection booklets. They also assist in providing resource materials for our sacramental preparation programs, bereavement ministry and family committee lending library. In addition, they provide resources for staff and students at ECCS. The Catholic Literature Committee meets quarterly. Contact: Paulette Rostad (647-5116). 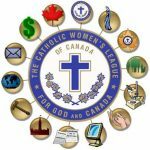 The Catholic Women's League is a national organization of Catholic women who are rooted in gospel values. The goal of the CWL is to call its members to holiness through service to the People of God. The CWL is open to all women of the Parish, sixteen years or older. The CWL meets once a month (usually the first Wednesday of the month). The Grey Sisters' Associates are a group of women and men who desire to journey with the Grey Sisters as they follow the footsteps of St. Marguerite d'Youville. The Associates gather once a month for a time of prayer and sharing. Contact: Rita Hogan (647-4525). The Knights of Columbus is an organized body of loyal Catholic laymen providing fraternal association to serve and grow in their faith. Their activities include providing assistance to those in need, strengthening family life and defending the unborn and aged. The Knights of Columbus is open to all men in the Parish, eighteen years or older. The Knights of Columbus meet once a month (usually the third Tuesday of the month). The Rosary Prayer Group is a group of parishioners who commit themselves to prayer, in particular the rosary, on a regular basis in the Church. Their three primary intentions are to pray for the protection of the priesthood, the needs of our Parish and parishioners and the strengthening of the family unit. The Rosary Prayer Group meet on Thursdays at 1:15 PM. The Visitation Commitee is a group of men and women who commit themselves to comfort and care for the sick and lonely of our Parish by making regular visits to them. Some members of the Visitation Committee bring Holy Communion to those who are unable to attend Mass on a regular basis. Training is provided to assist members in their ministry. The Visitation Committee meets quarterly.